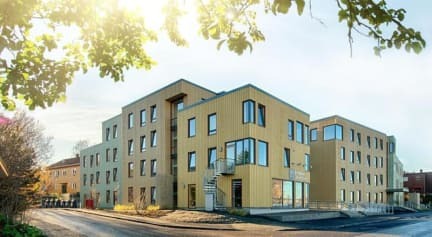 At Trondheim Hostel we offer accommodation for reasonable prices. Our cheapest alternative is a bed in four-bed dormitory. As a guest in our dorms you have access to share bathroom, fully equipped kitchen and TV-area with other guests. For families travelling together we have family rooms that are equipped with two bunk beds where one of the lowest bed is 120 cm wide. 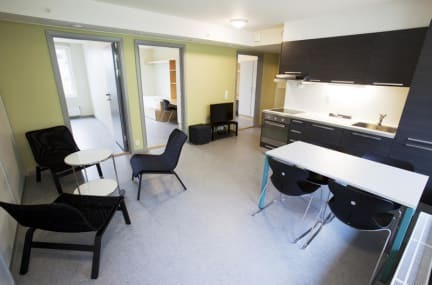 We also have single/double rooms that are built in living communities of three, whereby each community share their own private kitchen and bathroom. These rooms can also be rented on long-terms. Our reception is open from 07:00 to 22:00. Check in starts at 15:00. Check-in after 22:00 can be arranged. Everything was OK except the atmosphere. Not a lot of people in the common areas, the place was to quiet for me. A radio would make a huge difference.